The Nissan Qashqai is the best-selling model in Denmark this month. 2018 is starting to look like it might be a second year in negative for Denmark, with March sales plunging by 13.2% to 19.757 units and year-to-date volumes now down 4.9% to 56.952. Brand leader Volkswagen bucks the trend with a 1% year-on-year gain to 14.3% share, almost one percentage point above its YTD level, but the next six best-sellers all decline: Nissan (-20%) is the hardest hit followed by Ford (-19%), Citroen (-12%), Peugeot (-11%), Toyota (-11%) and Skoda (-5%). Mercedes posts the largest year-on-year gain in the Top 20 at +30%, wth BMW (+25%) and Volvo (+12%) the only two other gainers. Further down, Tesla (+800%), Subaru (+138%), Mini (+59%), Jaguar (+46%), Alfa Romeo (+38%) and Land Rover (+38%) all post spectacular improvements but don’t account for more than 0.4% share each. 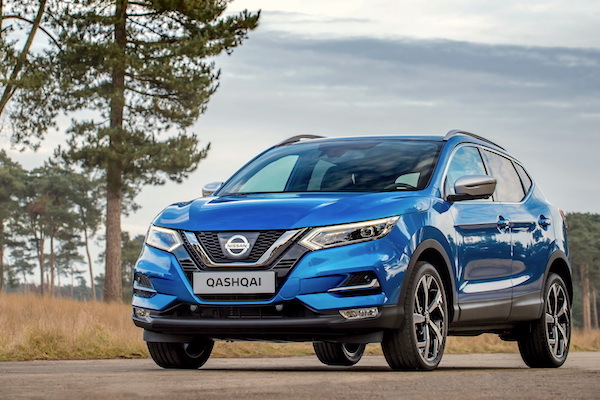 Despite a 19% year-on-year decline, the Nissan Qashqai is the best-selling vehicle in Denmark this month, like it was a year ago in March 2017 and last November. The Peugeot 208 (-8%) however remains by far #1 YTD at 5.5% share vs. 4.7% for the Qashqai. The Citroen C4 Picasso (+139%), Mercedes A Class (+133%), Skoda Fabia (+78%), VW Golf (+60%), Peugeot 3008 (+44%) and Toyota Yaris (+31%) shine in the Top 20 whereas the VW Up (-43%), Renault Clio (-39%), VW Polo (-34%) and Ford Fiesta (-28%) struggle. The VW T-Roc continues to dominate recent launches (<12 months), edging up one spot on February to #17, ahead of the Opel Crossland X at #36 (+9), Skoda Karoq at #59 (+42), Opel Grandland X at #60 (+34) and Seat Arona at #61 (+32). Full March 2018 Top 37 All-brands and Top 240 All-models below.